Malacca Penang CTI 4, Kompleks Terminal, Melaka Sentral, Melaka Kaunter 22, Terminal Bas Ekspres, Jalan Sultan Azlan Shah, 11900 Bayan Lepas, Pulau Pinang. Malacca Penang - Please note that there will be additional RM1 surcharge per ticket. - Please PRINT THE CONFIRMATION EMAIL for boarding. - For any other inquiry, passenger can approach the counter to request, subjected to approval. For general inquiry on booking via busonlineticket, please email to sales@busonlineticket.com CTI 4, Kompleks Terminal, Melaka Sentral, Melaka Kaunter 22, Terminal Bas Ekspres, Jalan Sultan Azlan Shah, 11900 Bayan Lepas, Pulau Pinang. 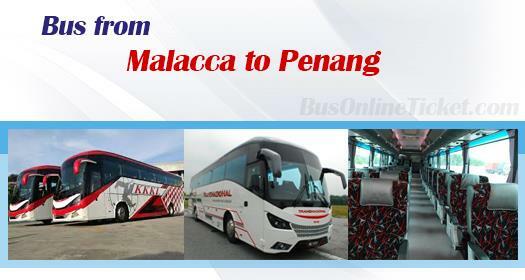 Bus from Melaka to Penang is the most important route to connect travellers and local people between the two top-rated tourist attraction in Malaysia. Travellers like to take bus from Melaka to Penang is because there is no flight and train service available for this route service, hence the only way to travel from Melaka to Penang is by bus. Transnasional and KKKL Express are the two main bus operators providing bus service from Melaka to Penang. Transnasional is the dominant players in this service by having up to 3 daily departures, while KKKL Express only provides one daily departures. The first bus service starts as early as 9.00am in the morning. The following schedules are 8.00pm, 9.00pm and 9:30pm. Please note that there is no bus schedule for afternoon session. The duration required for bus from Melaka to Penang is about 7 hours, depending on the traffic and weather conditions on your departure day. Because this is long journey, at least one washroom break will be given during the journey. Additional breaks will be given upon request from the driver during the journey. The bus fare for bus from Melaka to Penang is charged in a range of RM 49.30 to RM 55.00, depending on the choice of operator. The boarding point in Melaka is in Melaka Sentral Bus Terminal while the arrival point in Penang is at Sungai Nibong Bus Terminal. Throughout the years, BusOnlineTicket.com has become the most popular ticketing portal in Malaysia by providing a safe and convenient online ticket booking experience for the customers. Our customers not only can purchase bus tickets on our official website, they also can purchase their bus tickets through our official mobile app which can be downloaded at Google Play or App Store.